I haven't given up on finding a pair of reasonably priced Moe Light Honeycomb tangerine-gold pendants, but if I ever do, I think the Rejuvenation Corona pendant light would make a perfect modern light substitute. And while I'd personally go with orange, there are plenty of great modern color options available. 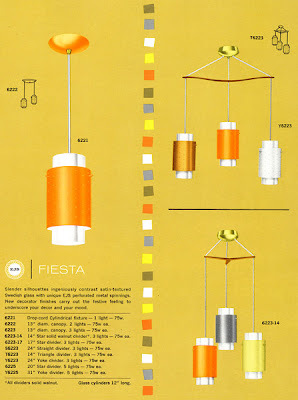 The Corona is based off of a truly mid-century pendant light, the EJS Lighting Fiesta (boy, that name sounds familiar). Ever heard of EJS Lighting Corporation? Neither had we. Then we acquired a 1959 catalog from this Los Angeles manufacturer and realized that not only did they offer an astounding array of awesome mid-century modern lighting, but we had quite a few of their original fixtures hanging around in our product archives. 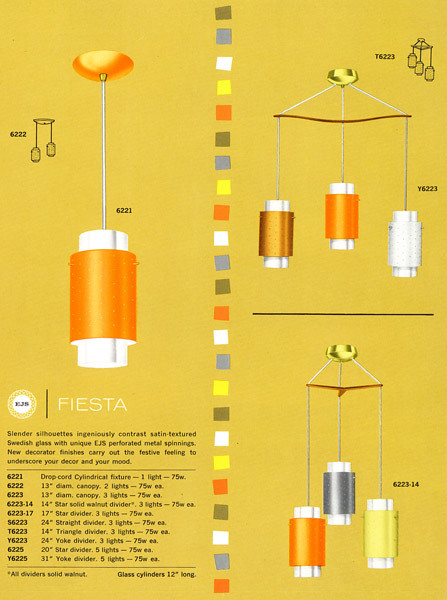 The EJS line included hip hourglass chandeliers, classic pull-downs, elegant Swedish-glass shades, and the iconic "Glow-Bal" sphere pendants - but it was the Fiesta series that really caught our eye with its distinctive cylinder-in-a-cylinder design, mix-and-match color palette, and creative configuration options. I'd love to have that single pendant over my sink. I like it so much that it might be worth figuring out a real solution to the huge hole up there. There are those ceiling medallions that you might be able to use to cover it up. We used one in our first place to cover an extra large hole around a new fan. I've also see people use pieces of decorative wood to cover large holes, and then hang the new light fixture from the wood.